How do you stay on track during small groups? An important part of my teaching schedule includes a daily pull-out session with small groups of 4-5 students. We meet for 45 minutes every afternoon for an intensive session focused on IEP goals and objectives. Behavior and time on-task plays a significant role in the success of these sessions. I’ve tried many, many different incentives, seating arrangements, you-name-it…with mixed results. This is obviously not high-tech, but it has caught my students’ attention. I believe it’s a combination of having a structure of activities and the fact that I just may let a student use one of the cool crayons to cross off the list (extra incentive!). Our agenda rarely changes…we start with journal writing (more on this coming soon! ), math warm-up (i.e. : a quick flashcard race or problem-solving with manipulatives), lightning-fast sight words review, songs (phonics – I use Heidi’s Songs), Long E (a focused phonics mini-lesson – I will usually keep the same topic for one week with a variety of hands-on activities), and then an earned “brain break.” We decide together what the brain break should be…i.e. 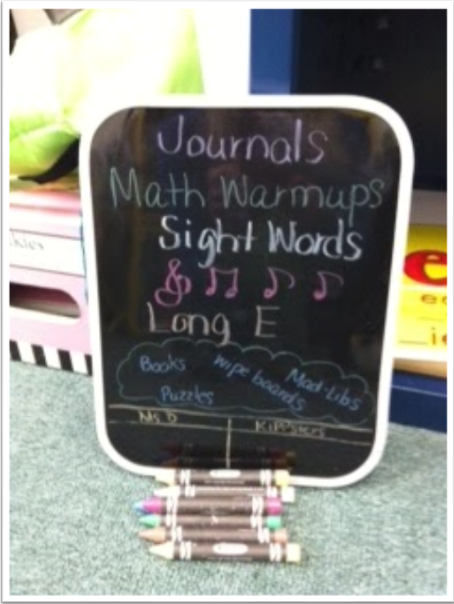 : a puzzle, using wipe boards for 5 minutes, file folder games, etc. If any teachers or interventionists out there have any ideas for small groups, please pass them on! « Number Sense is Making Sense!